Meredith-Springfield in Ludlow, MA specializes in blow-molded plastic PET products. We are well-equipped to deliver injection stretch-blow molded (ISBM) PET as well as extrusion blow molded (EBM) PET or EPET. While some may consider the EPET market to be emerging, our experience goes back over two decades. With so many steps to the EPET process, in particular—drying, blending, recrystallizing regrind—customers benefit from this expertise. And, our specialty machines and stringent monitoring systems carefully regulate material temperatures—to deliver consistent results. 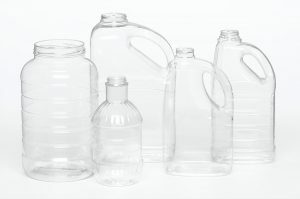 Polyethylene Terephthalate, or PET, is a safe, non-toxic, lightweight material that is 100% recyclable. Meredith-Springfield uses PET to blow-mold products for the food and spice, liquor, health and beauty industries. These items include glass replacement products, which are considerably heavier and more expensive to produce. Our use of Aoki’s proprietary “Direct Heatcon” technology is a cost-efficient, energy-saving, one-step injection stretch blow process that has enabled us to produce highly technical articles and containers that competitors simply cannot create with two-step molding using pre-forms. As a result of our investment, Meredith-Springfield formed a partnership with a major food and personal care products companies and has since become their exclusive supplier of containers for many nationally recognized brands and products requiring this service. Meredith-Springfield excels at extrusion PET with a Pure #1 (no blends or co-polymers). This material is environmentally friendly and allows for weight customization during both the manufacturing and sampling process — making it ideal for quick-to-market products. Browse our website or contact us today to learn more about Meredith-Springfield, our commitment to going ‘green’ or our expansive list of capabilities.